Later that week when all the ambassadors were posting their reviews (which is really boring and annoying, but that is a whole other post in itself), an ambassador asked if she should still do her review even though she didn’t like her product either. I chimed in and told her about mine and how I still wrote about the product even though I did have anything good to say. Before I did write my review, I emailed one of our ambassador managers and told her I didn’t like the product and if it was okay to still post, even though this was a sponsored campaign. She never really answered and just asked if I would like to try something else. I was kind of annoyed with this, so that definitely made me want to write my review honestly. A review is your thoughts, options, evaluation, critique of a product or service. It should not be influenced by outside sources or pressure from a brand or company to highlight them in a good light because you received the product or other compensation. I know that not everyone likes everything, so when I know there is a big campaign going on and see reviews for the same products for weeks on bloggers posts, I know some of them have to be stretching the truth. I rarely ever see “negative” reviews. But those are the ones I want to read! If I want to know that a product is great and contains this and does not contain that and is so awesome, I could just go on that company’s website and read about their product in their own self-promoting marketing. Why are we scared to write our honest feelings? Peter, from the Blogologist wrote a great post on honest reviews back in 2013. I like the part where he discusses the fear of trashing a product in a review. He goes on to state that it is actually beneficial to do so and to stay honest. You might think you will lose all ties with a company if you don’t give them a good review, but usually that is the total opposite. Companies like to hear what you think so they can improve their products and make their services better. You are essentially their test subject and they want to hear what you have to say. If you really just absolutely hate a product that you receive and don;t even want to mention in to your readers, just let the company know you don;t feel comfortable writing anything up. They are usually fine with it and ask you for your personal feedback in an email. But don’t be scared to write you thoughts on your blog either. Especially if you bought something with your own money, you should not feel pressure to be utterly positive and upbeat about it if you don’t like it. I want to read the negative reviews. I want to read the real thoughts on a product or service from real people. Not polished over sponsored posts that completely praise a crappy product. I want to hear you thoughts on all of this, so lets have a discussion in the comments! Keep it classy and no bashing, lets just be honest! + Do you feel pressure to write only positive reviews? + Are you sick of seeing only positive reviews? I am. I hate when campaigns come around for the big companies and about 50 of the bloggers I read, and more, write essentially the same post, praising a product. It is so boring and I just skip them now. No one wants to read that unless you are not a blogger and are really looking into a product. That’s why if you put your real thoughts, it would be a hell of a lot more interesting and more helpful for readers and bloggers alike. + Do you have a personal policy on writing reviews? Do you discuss this with the company or brand before you write? I’ve only done one review post where I was sent product by the company – all the others have been items I bought myself and decided to shout them out. It was an easy choice for me because I was contacted by a brand I already knew I loved and I had actually already done a review/giveaway with that brand with my own money. As I get more opportunities, I have thought of this issue – do I want to agree to review a product I have never heard of? What if I hate it? I won’t lie to my readers, but I don’t know what the etiquette is on that either. It’s kind of iffy when many times the company, as you said, is running a promotional campaign and you’re obligated to promote it – it’s not solely a review. Its not a review if you obligated to promote it. Its against the regulations as well. Reviews are unbiased discussions with your readers on your experience and thoughts on a product or survice. I love this post! And I have to admit, I reviewed a product that I absolutely despised and didn’t say so on my blog. I didn’t say it was great, either – I kind of danced around the subject altogether and wrote more of an informational post – “here is this product, here’s how it’s used, here’s a recipe you can try.” My conscience was clear because I wasn’t dishonest, but it never sat quite right with me. After reading your post, I started thinking about what types of product reviews I like reading – and you’re absolutely right. I want to read the honest ones. Now, I also don’t like reading negative reviews though. I read one just a few minutes ago, and it made me cringe. It was very uncomfortable to read. So I think the key is to be honest but in a way that doesn’t make you sound like a turd. Thank you Sharon! Yes we need to be honest, but keep it classy. No one likes a bully either. We can be negative about something in a respectful way to not only the company and your readers but also yourself! You said it perfectly! I think I always have a fear that my review will be colored by the fact that it was free or sponsored. I’m not too afraid to give negative reviews; I just try to be tactful and polite about it, especially when it’s a book I’ve been sent to review. Overly positive reviews help nobody. You said it perfectly too! No need to be mean but no need to sugarcoat it either! AMEN!!! And Ditto. Thank you for writing this and sharing on SITS. Honesty IS the best policy. Thanks Trish! Happy to share my thoughts! I couldn’t agree with you more! I want to know whats really going on with a product before I buy it. I reviewed a product for a company once that actually caused a physical irritation and I wrote about it honestly. The company actually responded on the blog for all to see their concern for the issue and wanted to make it better. This is what its all about. We spoke privately later and they said that info made a difference. Stopping by from SITS Share! That’s great that they were cooperative and thankful! That’s the sign of a good company no matter if the product was right for you or not. Those kind of reviews are more of what we need! It is true that it feels conflicting to write something negative,especially when you are being reimbursed in some manner. But, if they ask for your opinion, you should be able to honestly give it. I think you did a wonderful thing by asking them in advance. Their response was interesting. We need to be able to trust reviews and not just think everything out there is wonderful. Great post! Yup! We should not have to worry about reading “fake” reviews, but be able to read “real” reviews, by REAL people, not companies! Great post! i don’t do that many reviews, but if asked, and it’s a product that looks good “on paper”, my policy is to tell the company I will try it, and if I like it, and would recommend it to my readers, I will write a review. So, yes, all my reviews are positive, but I have gotten samples of product I don’t like, told the company, and not written about them, mainly b/c I don’t really want to spend what little blog writing time I do have, writing a negative one, but that’s just my personal preference. That is a great policy to have! You should never feel forced to write something, but if you do, don’t be scared to let your true thoughts out about a product! I love this post. Found you through Link’n Blogs link up. I’m a fairly new blogger and I’ve refused to do reviews if I don’t like the product because I don’t want to endorse things that I don’t really love. I totally agree with you that one shouldn’t be swayed just because the product was complimentary. I think it’s important for bloggers to be honest in their reviews. Would love if you shared this post tomorrow on Merry Monday Linky Party at 6pm PST. Thanks Erlene. I just think we as bloggers should not be scared to put our true thoughts about a product out there. If we don’t like something, we shouldn’t have to hide it, we should just say it so others can read, learn, and get more than just cheery positive all the time! I agree, too often I see posts where the blogger gushes on and on about how amazing the product is. Sometimes I’ve noticed that the blogger just repeats everything that is on the company site. There are a few blogs that I used to love until the blogger started doing that for half the posts, and I’m gradually drifting away from those sites. Yes! That is what annoys me to no end! Especially when it is a sponsored campaign post, I know bloggers are supposed to use specific wording in some parts, but it get so mundane and boring! Be more creative at least! I don’t want to read the same benefits and nutritionals that I can read on the company website or the other 50 blog reviews I’ve seen for it! I love your honesty. That’s what brings readers back. Everyone can give positive reviews when they are given free samples but not everyone has the guts to post what they’re really thinking. There is always fear that another sponsorship or freeby won’t be provided because you are put on a company’s “black list”. I think this is too rare and not being honest with your readers is a wrse offense. I’m not writing reviews yet, but hope to get that point with my blog. 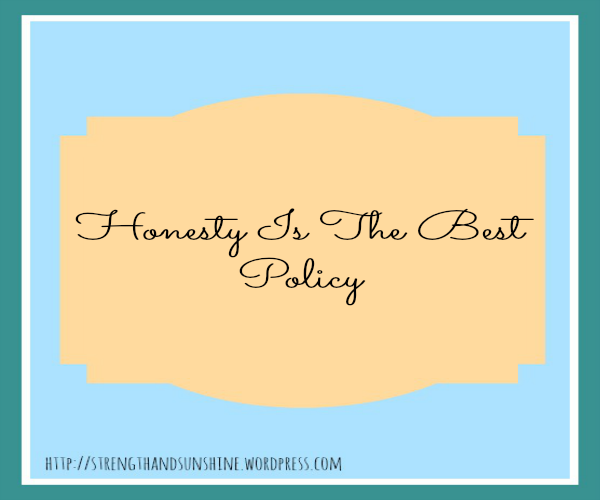 Honesty is definitely the best policy…I do get annoyed when I see a wave of product reviews on my Bloglovin, and it does make me suspicious. I don’t think negative reviews are a bad thing, but I do think they should be done respectfully. If a company gave you an opportunity to try their products I don’t think it’s right to use your platform to trash them. I’ve never read any reviews like that but I’m sure they’re out there! There can and should be a balance of positive and negative, but most of all RESPECTFUL product reviews! Exactly! I’ve never seen a trashing review. That would be not good either. I just believe that every review does not need to be only positive. I agree with you and absolutely give my honest opinion on products I am reviewing. I have only had a few situations where I couldn’t offer a positive point to a product and contacted the brand ahead of time to let them know. They weren’t thrilled but I wasn’t about to lie and say I liked something when I didn’t. Good for you! That’s always the best thing to do when they are expecting a review. Let them know! I have a policy I discuss with brands up front about this and for the most part it has worked out well. I’m up front about it. Once I started saying no thank you to brands the less than positive review situations have been few and far between. I just think that readers deserve to see not only positive reviews, but also the other side as well. It makes opinions and info more interesting and more realistic. You’ve got the right idea girl! I usually do end up liking everything too because the stuff I know I won’t, I just don’t accept in the first place! Bravo for posting this! It’s actually poor “disclosure” if you don’t like a produce and DON’T review it so I give you mucho credit for sharing your true thoughts. Ha, well that’s good to know then! Keeping everyone informed and honest! I just LOVE this post! I still consider myself new to blogging and I always wondered how bloggers handled products they didn’t actually like. I’ve been a blog reader for forever and I’ve been upset before when I bought something that all the bloggers were raving about and.it.sucked. I don’t want to name names but … there are a few bloggers whose opinions in food I no longer trust! Haha well I’m sorry you’ve wasted money! And I’m glad you respect honesty in those you read 🙂 At least you know to be an honest blogger yourself now! I’m not a blogger (yet? ), but honesty is my only way of life. I would expect positive and negative reviews from you–otherwise you couldn’t trust the reviews (can’t like every product out there!). And if people expect honesty from you they tend to be less offended (just ask my family, i get away with speaking my mind freely –most of the time–bc they know that is me). I get tired of reading product reviews. If I don’t like something I won’t write about it and if I know something doesn’t work for me I often don’t apply for some reviews ( I.e. I truly don’t like the taste of any protein powder and won’t try them ever again to review.) As I’ve grown as a blogger saying no has come easier. It does comes easier over time! I know that when you first starting out, it is so damn exciting to get your first email from a company (even if it’s a small unknown one! ), but eventually we all find our footing and start to blog by our integrity. As a baby blogger, I felt pressure to always be positive. But now that I’m a more seasoned blogger, I have no qualms about being honest. I also get sick of seeing bland, positive reviews – especially when I’ve talked to the blogger privately and they admitted their dislike of the product! I always try to be honest and find one or two good things, even if the product isn’t up to par. And I try to make good reviews a bit more unique than most. I’ve never discussed my review with the company before posting. However, I’ve received positive company feedback about my negative reviews! For example, I negatively reviewed two products that I received through Influenster. For both products, the company & Influenster chose me as the Top Brand Badge holder, and I received huge prize packs. Honesty pays off! That is great! See, those are the companies you want to work with. That is the whole point of having real people review their products or services. To get real reviews and real opinions! Common sense really. Bravo! I completely agree! Thanks for linking up with Manic Mondays! Can’t go wrong with honesty! I write as honestly as I can about anything I review on the blog but it isn’t always easy because I’m concerned about how that will effect the relationship with the company. But then I think about my viewers opinions and realize they count more. They do count more and if the company really values you as an asset, they will welcome criticism and feedback even more! I did a soy protein review a few months ago and I liked some of the products, but not all of them. I was honest about which ones I didn’t like. I agree with you about ready the same review over and over. Last year the same group of bloggers ran almost every Disney race and I got so sick of reading their reviews that when they popped up I just deleted them off of my feed. I feel the same about most product reviews too. Yea, it just gets to be to much. I usually just skip over them too even if it is one of my favorite bloggers. I just can’t handle the same peppy review all the time. And you can’t even call some of them reviews, just highlighting ingredients and “benefits” really. I totally feel you on this! I have been in the situation where I wanted to post a negative review and when I reached out to the company warning them what I was going to post, they offered to send me MORE products – in hopes I’d change my mind?? However on the other side of the coin, I get annoyed when people criticize me for posting positive reviews because they assume I am lying. I can go to a restaurant and have a magical experience and I know if I blog about that, I’m going to get at least one comment from someone claiming I’m only saying that because of X or Y. I wish that positive reviews didn’t have such a stigma either! And I understand that. But you always have unique reviews that no one else has. Your not a blogger who only does the reviews of small products that everyone does and seems fake. You reviews are unique and of actual experiences and you have so much to say! Definitely such an interesting post – and I agree with your perspective! For me, I’ve decided that I won’t post a review if I don’t like the product – not because I think we shouldn’t do negative reviews, but because I don’t really enjoy writing them! I think, overall, the goal is honesty, and you are definitely promoting that! That is perfectly fine! As long as everything your write is honest and true, you are a respectable blogger! I totally agree with this. I’ve seen 5748957 reviews for the same products and they always come in bursts. I try to limit what I review for this reason. Most of the time I do love the product which is why I’m reviewing it, but I wouldn’t hesitate to write my true opinions either. Exactly! Reviews can get super boring no matter what, that’s why I like to do one big post with a bunch of small reviews so things keep flowing and not to boring for my readers! When you get free stuff to review there’s definitely pressure to write positive things. But I’m with you, honesty is best. There need to be realistic reviews out there, not gushy positive notes because someone sent you free swag. That’s part of why blogger reviews are so powerful, bloggers are real people who are trusted. Most of the time when I get things that aren’t impressive, it’s one-item out of multiple so I don’t bother talking about it but I will mention that it wasn’t my thing. The people asking for the product reviews understand 100% that they can’t control what you say or if you even like their product, if they don’t, there’s a problem. Good for you for being honest! If I don’t like something I usually just throw it into a post that has a bunch of random small things. I like to do random reviews or current things (I’m planning one for next week!). That way it isn’t a big huge deal, but my thoughts still get out there. I always write honest reviews and if I don’t like something I do contact the company first. Them offering you another product isn’t bad in my opinion, I do think some companies want you to truly enjoy something from their company, I don’t think it is shady. Some bloggers only like to write reviews for products they actually enjoy which is why you see a lot of positive reviews, again not a bad practice. I think it can sound off that you complain that other people are writing positive reviews, they may have had a different experience than you. If they are writing a false review that’s on them. I like X product and so does my BFF, but she also loves Y product and I think it is gross. That doesn’t mean she is lying. It doesn’t mean they are living, but it gets so boreing and monotonous and does not really help anyone reading the review. I just want to see quality truth in your own unique voice when I read a review. I would love to read more honest reviews. I know when we do campaigns through Fit Approach or Fitfluential, they ALL come out at the same time, so it can be challenging to read through 20-40 “OMG this is so amazing and here are 5 selfies of me smiling with the product.” This is real life, there’s no way every single person thought it was the best thing ever. If I buy it based off of all those reviews and it turns out to be horrible, I’d feel mislead! You said it girl! That’s doming I don’t understand though with these ambassadorships and brands. They know most of us are all connected and will end up reading over 50 of the same review. They should either be more selective or we as bloggers should be more unique. Such a good post! I am now trying to shy away from product reviews that everyone is doing for the same reason, it gets boring. I only try to share posts that I actually like and think my readers would like as well. Thanks for the post!! It does get so boring! Especially if your a blogger yourself which I feel most of us are. So when that happens we really need to make our review stand out by breaking the norm and talking the truth! Such a great point! If you don’t like a product you should be able to share that. I remember when I reviewed Energy Bits, I gave them a not so positive review. But you’re right, the company contacted me and THANKED me for the honest review. And I have had so many other people comment and thank me for the honest review because all they have seen is promotion by ambassadors of the company. That is great! I’ve worked with then before and know they have some good people in their company that respect their reviewers! Positive, negative, all! Absolutely. Real and honest thoughts with a personal voice – yes! I’ve recently been in touch with several companies offering to mail me products for review but made it a point that I was going to be honest if I didn’t like something. Like you said: that’s the kind of review I’d want to read myself. I can’t add much to what you said, actually, because these are my thoughts, too. I’m especially suspicious if a blogger writes a rave review about a product that doesn’t fit their usual content or – if we’re talking food – dietary preferences. On a last note I will admit my first reviews from way back weren’t quite what I’d write today, either. But we make mistakes to improve so that’s what I’m striving for in my next ones. I’m glad you also mentioned the option of not reviewing a product at all if I have nothing positive to say about it because I think I’d have felt like I still should mention it. Thanks for the heads-up! My first review was not honest and I am ashamed now if that. I was still a new baby blogger though. Mistakes will be made. But I have learned that I will accept products for review (I love it) and now write only my real true feelings. I have turned products down, I’ve not reviewed some things, but I’ve also found some wonderful things that deserve the best! Definitely keep it honest. Integrity is valuable currency to a blogger. We have never accepted payment for reviews, but we do offer reviews in exchange for product. In an effort to keep the tone of my blog upbeat, we don’t post overall ‘negative’ reviews. We do include a product’s “Cons” (if we found any) — usually things like cost, availability, selection. And statements like ‘I wish it were a little more’ ….. , if you are —– type of runner you may not like ——- and ‘this product could be improved by ….. ” So while we do strive to stay positive, we don’t want it to be all glowing fluff either. At the beginning of the process though, in my communications with the sponsors, I let them know that if there is any issues, I will contact them to address it. Almost all our reviews are done in conjunction with a giveaway, so we certainly wont give away something we dislike. Because of this, I would say less than half of the items we review actually make it onto the blog. And yes, some sponsors were less than thrilled when we offered suggestions to improve their product, and yes some of our ‘blogger ambassador groups’ were less than thrilled when I refused to wax poetic on some of their brand partners. Just stay true to your policy for your own integrity. All aspects should be stated, nothing hidden. That is reviewing the whole product. I have never gotten a paid opportunity, but if I did I would inform the company before hand if I disliked it so we could keep an open line if communication. Yes….there were some products I was not pleased with and when I gave an honest review I was frowned upon by the company. Wow. Really 🙁 Well that just means they are not a good company to work with anyway! When I started blogging I was really unsure how to handle reviews. My policy now is to only review (because reviewing is essentially promoting) the brands and products I like. But even then I mention things that could be improved, because it is a very rare product that I am 110% happy with. That’s great! I am happy reviewing products I like and don’t like. I like a broad range to share! OK you’ve shamed me a bit here. I just started writing reviews for sponsored posts and I did write one for Vega. I omitted one or two thoughts- THERE! I said it. *Hangs head in shame. I suppose it’s fear that as a blogger trying to turn this hobby into a paid gig, I’m not going to get future opportunities. Your comments are setting me straight here. I’ve been feeling off on how to balance the want for financial compensation and the need for honest writing. Not just with this Vega post, but in general. I agree with you that their needs to be more opinionated reporting of products, not just for the sake of other bloggers in our network, but for the people looking to get healthy and are looking to out blogs for some direction. Judging by the comments on your post, I’d say you’re not alone with your thoughts! TYPO: “there needs to be…” not “their…” because I HATE when I read that typo in other posts and will not be guilty of same in mine! Thanks for being honest here! You will get more respect and credibility not only with your readers, but also brands, if you write honestly. Its okay to slip up, but learn that honesty and your true feelings are best! I like honest reviews too! I think there is a way to say how you feel without being insulting or mean. Some people think that negative reviews are mean but that doesn’t have to be the case. Kudos to you for staying true to yourself! Exactly! You don’t have to curse a brand, but there is no shame in sharing your dislike! Definitely think you are right! You need to be honest. I am a newbie getfit person who is reading your blog and others, I would hope that your opinion is exactly that, yours. If I wanted to follow brands I would. I choose to follow human beings, and preferably not ones that have been paid (bribed) to say something positive. Nicely said! We are all people and in this community we should be promoting honesty and trust while helping each other out! Completely agree!! Nothing turns me off more. And I rarely do product reviews unless there is something out there I really want to try but sponsored posts have become so homogenized! I have never written a product review. I was contacted once about reviewing compression socks (which I never wore before- ever! ), but the company never sent them to me. If I were to review something, you better believe it would be honest. I’m not into BS! Honesty is always the best policy! After seeing mostly positive reviews for Vega, I was scared to write about my negative experience, which is why I posted to the FB group seeking feedback on how to proceed. I am now trying out a different product, and I greatly appreciate the opportunity to try something different. I plan to honestly review both products I’ve tried when I write my review on my blog next week. Yes! 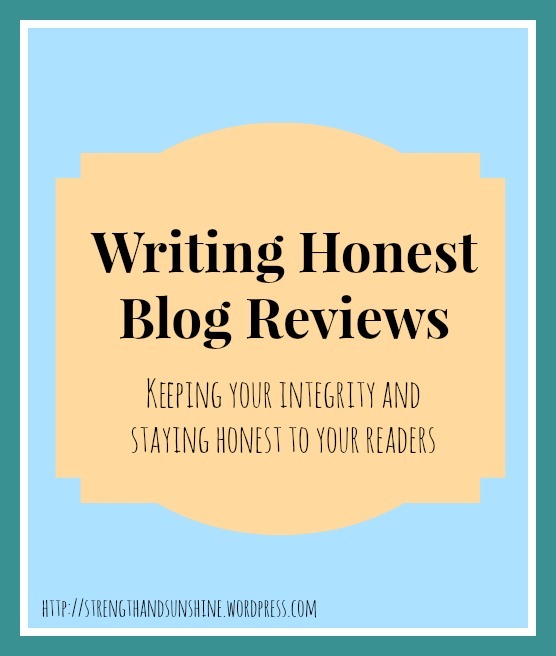 And if a blogger only ever has nice things to say, I don’t believe them, so I think that providing honest reviews with pros and cons actually increases your influence. I 100% agree! That’s the reality of real feelings! I love this post. I’m much more likely to believe a blogger’s reviews when there are some that aren’t entirely positive. If I’m reviewing something that I didn’t like, I try to point out the positives but then explain why I didn’t like it. For something edible, that might mean I mention the good ingredients, etc., and then say the taste wasn’t for me. But that tastes differ. If I don’t like something I’m not going to try to make anything positive. I’m not reviewing it to make a company happy. Anyone who tells you they do not have a bias is lying. Why else would companies continue to promote their products that way? Furthermore there is no blogging code of integrity, so it is always reader beware. Kudos for posting your real feelings, though. I appreciate your honesty. That’s how I run my blog and its reviews, too. Honesty first. I have shared my share of negative reviews, too. I once wrote a negative review for a blogger’s cookbook and she quickly started ignoring me. Oh well. That’s her lose! Not everyone is going to like something and we all need to see that and understand it. I agree with you. I always write an honest review. And I actually will not accept compensation for any review I do (except for sample merchandise) and sometimes buy the product myself. To me, that’s the only way to relinquish any conflict of interest. I know that when a few SPA’s discussed if they should do their reviews cause they didn’t like the product, a few others said :”if you don’t have anything nice to say…”. What? No no no. How is the brand going to know the truth if all we post is sunshine and rainbows. TELL THE TRUTH! I didn’t like the flavor of the Vega Sport Pre-workout, but I liked that it did work for me, and I said so in my review. Yes we need to hear every opinion! Positive and negative! How else would reviews be helpful. We should be able to read about your personal experience, that’s the point. Im always always honest….Ill give the brand a heads up if theres a problem with the item Im addressing in print—but ALWAYS BRUTALLY HONEST. Yes! That is the way yo be! I want to read about your real thoughts and feelings! Not the dressed up polished ones. Ahh sooo true! I think the only POINT in a review is to give a fair and balanced (honest!) review – otherwise what’s the point? You might as well say ‘I got sent this product for free. Go buy it.’ I always give what I like and didn’t like about a product, and if the sponsor/PR people don’t like that? Screw ’em, we’re entitled to share our opinion. I never share a post unless it’s completely true. I’ve sent money back to companies for sponsored posts when I didn’t like the product or couldn’t confidently recommend it to our readers – and the same goes with recipes, they will never go on the blog unless we LOVE them and at least one other person than Jesse or I likes it too. That is good integrity to have! And when readers see that, they will respect your posts and reviews so much more and know that what they are reading is your own true words! Love everything about this post!! It drives me crazy when someone says how lovely a certain product is when in reality.. It’s no good. I do understand everyone has their own taste, but I absolutely believe reviews are meant to be honest. I think that may be one reason why I try to make mine so thorough. Sure they may seem long, but at least I’m not just saying it was awesome, buy this product, the end. Exactly! I want quality reviews and then I will read them. But I just feel like there is to much of the same and I know everyone has different opinions, and that is what I want to read!